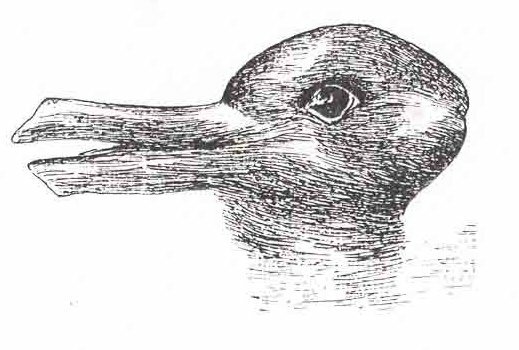 Visual illusions, such as the rabbit-duck (shown below) and café wall are fascinating because they remind us of the discrepancy between perception and reality. But our knowledge of such illusions has been largely limited to studying humans. That is now changing. There is mounting evidence that other animals can fall prey to the same illusions. Understanding whether these illusions arise in different brains could help us understand how evolution shapes visual perception. For neuroscientists and psychologists, illusions not only reveal how visual scenes are interpreted and mentally reconstructed, they also highlight constraints in our perception. They can take hundreds of different forms and can affect our perception of size, motion, colour, brightness, 3D form and much more. Artists, architects and designers have used illusions for centuries to distort our perception. Some of the most common types of illusory percepts are those that affect the impression of size, length, or distance. For example, Ancient Greek architects designed columns for buildings so that they tapered and narrowed towards the top, creating the impression of a taller building when viewed from the ground. This type of illusion is called forced perspective, commonly used in ornamental gardens and stage design to make scenes appear larger or smaller. As visual processing needs to be both rapid and generally accurate, the brain constantly uses shortcuts and makes assumptions about the world that can, in some cases, be misleading. For example, the brain uses assumptions and the visual information surrounding an object (such as light level and presence of shadows) to adjust the perception of colour accordingly. Known as colour constancy, this perceptual process can be illustrated by the illusion of the coloured tiles. Both squares with asterisks are of the same colour, but the square on top of the cube in direct light appears brown whereas the square on the side in shadow appears orange, because the brain adjusts colour perception based on light conditions. These illusions are the result of visual processes shaped by evolution. Using that process may have been once beneficial (or still is), but it also allows our brains to be tricked. If it happens to humans, then it might happen to other animals too. And, if animals are tricked by the same illusions, then perhaps revealing why a different evolutionary path leads to the same visual process might help us understand why evolution favours this development. The idea that animal colouration might appear illusory was raised more than 100 years ago by American artist and naturalist Abbott Thayer and his son Gerald. Thayer was aware of the “optical tricks” used by artists and he argued that animal colouration could similarly create special effects, allowing animals with gaudy colouration to apparently become invisible. In a recent review of animal illusions (and other sensory forms of manipulation), we found evidence in support of Thayer’s original ideas. Although the evidence is only recently emerging, it seems, like humans, animals can perceive and create a range of visual illusions. Animals use visual signals (such as their colour patterns) for many purposes, including finding a mate and avoiding being eaten. Illusions can play a role in many of these scenarios. Great bowerbirds could be the ultimate illusory artists. For example, their males construct forced perspective illusions to make them more attractive to mates. Similar to Greek architects, this illusion may affect the female’s perception of size. Animals may also change their perceived size by changing their social surroundings. Female fiddler crabs prefer to mate with large-clawed males. When a male has two smaller clawed males on either side of him he is more attractive to a female (because he looks relatively larger) than if he was surrounded by two larger clawed males. This effect is known as the Ebbinghaus illusion, and suggests that males may easily manipulate their perceived attractiveness by surrounding themselves with less attractive rivals. However, there is not yet any evidence that male fiddler crabs actively move to court near smaller males. In the past 50 years, scientists have become aware that the sensory abilities of animals can be radically different from our own. Visual illusions (and those in the non-visual senses) are a crucial tool for determining what perceptual assumptions animals make about the world around them. Laura Kelley is a research fellow at the University of Cambridge and Jennifer Kelley is a Research Associate at the University of Western Australia. They are the co-authors of the paper ‘Animal visual illusion and confusion: the importance of a perceptual perspective‘, published in the journal Behavioural Ecology. 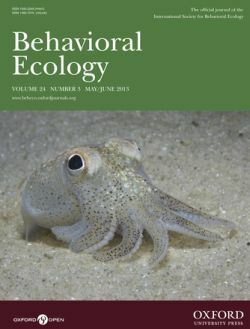 Bringing together significant work on all aspects of the subject, Behavioral Ecology is broad-based and covers both empirical and theoretical approaches. Studies on the whole range of behaving organisms, including plants, invertebrates, vertebrates, and humans, are welcomed. Subscribe to only earth and life sciences articles on the OUPblog via email or RSS.